Is your dog a digger? Don’t plant wire under the soil to stop him or you may hurt him. There are many garden gravels to choose from and many applications for gravel in the garden. Making a poor material selection can be both dangerous and ugly. Fortunately, with proper planning and installation, gravel can be a wonderful and relatively inexpensive hardscape material. On the left: angular 5/8s minus gravel. On the right: round decorative pebbles. Why do you need gravel? Trying to suppress weeds in a planting area? Creating a walkway, patio or driveway? Creating a decorative dry stream bed? Or something else? Walk ——> on a pathway made of compacted, angular gravel. 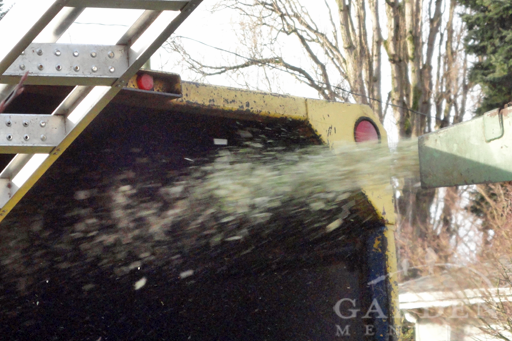 A common challenge is simply selecting the right gravel for the right application. If you’ve ever visited a stone yard, you’ve probably fallen in love with many colorful gravels on display. The problem with many of these gravels is their shape. 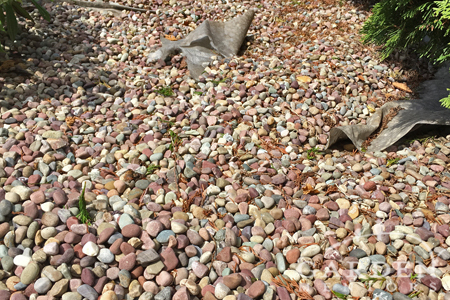 While using round stones in mixed sizes is ideal for creating a decorative dry stream bed, these stones simply do not compact into a safe, hard surface for pathways and patios. Soft mixes of pea gravel, round pebbles or even semi-angular pebbles with tumbled edges will turn into ankle-twisting walkways that neither a wheelchair nor a wheelbarrow can traverse. Colorful round pebbles may look nice at the garden center, but they aren’t nice to walk on. Landscape fabric beneath them makes for an additional rolling, ankle-twisting, falling hazard. 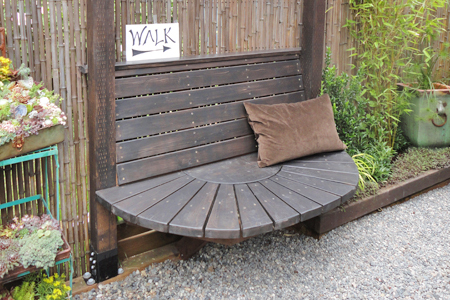 Instead, opt for something a little less showy for your walkways. 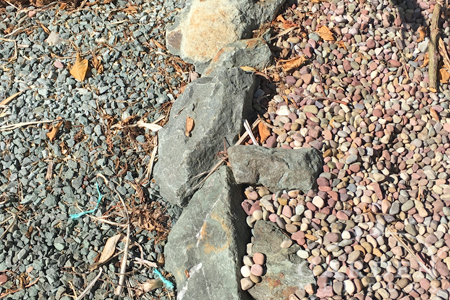 Truly angular rock with lots of fines will compact into a solid path that also drains. These gravels are usually referred to by the size of the largest partical in the mix: 5/8s-minus or 1/4″ minus are two popular options for walking paths. Even a formal garden looks & sounds great with crunchy, compacted angular gravel like this. These are also used as an ideal base material for permeable stone patios and paths. In fact, in most applications they work better than sand, which is also a bunch of tiny, round particles that don’t compact well. What about gravel to suppress weeds? Many believe that covering a planting area with decorative rock will keep weeds from growing. But, weeds are tough and will easily push right through a permeable pebble or gravel layer. The soil beneath multiple layers of landscape fabric & a thick covering of stones is hot, dry & hard as a rock. It’s going to take a while to rejuvenate this bed. 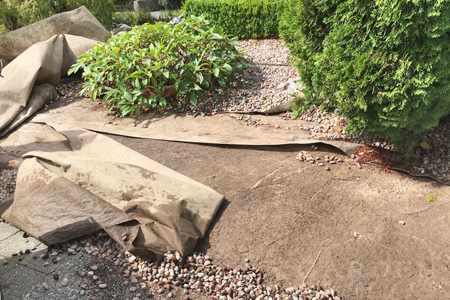 Once the pebbles & fabric are removed, covering the bare soil with fresh arborist chips will help suppress weeds, give the bed a finished look, allow moisture to pass through the soil & invite soil microbes to return the this rock-hard garden bed. 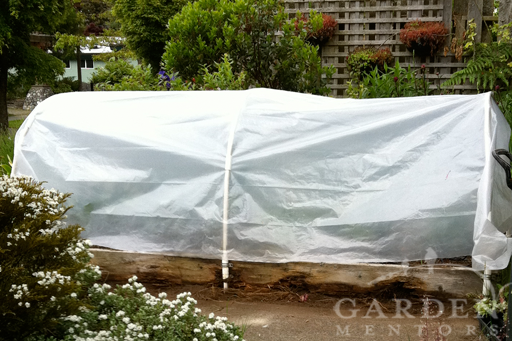 Too, a thick layer of stone placed over a planting bed may raise temperatures enough to burn tender plant roots below. While flame weeding over stone may be possible in some situations, running a flame weeder around plants may burn and even kill your garden. Should I put landscape fabric under my gravel? Covering the earth with landscape fabric and topping it with gravel path or patio is just asking for a twisted ankle or worse injury. That fabric is slippery. Stone on top just gets more slippery. Angular gravel that should compact into a safer walking layer, won’t tighten up over fabric. And round pebbles will roll worse than ever on that slick surface. Plus, in the wet season, water may end up pooling or sheeting in runoff streams when it can’t readily pass through fabric to the soil below. Cleaning up a bed filled with trashy landscape fabric and dangerous round rock is hard work. Plus, it may take many months for the soil to rejuvenate. Once all of the slippery, rolling hazards are removed from this bed, it will be possible to safely walk & plant in this area again. 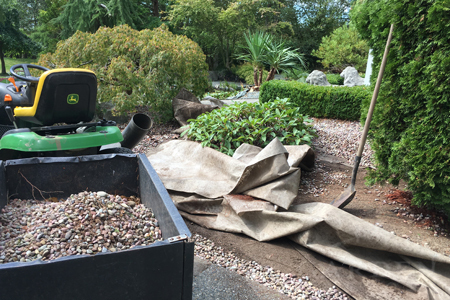 Adding a layer (or overlapping layers) of landscape fabric between your garden bed soil and a topping layer of gravel isn’t going to do you any weeding favors in the long run. That fabric layer will eventually pop up through the stone and look like trash flags on your garden floor. And, the fabric will inhibit moisture from flowing into the soil, which can stunt or kill your plants and the living eco-system within the soil itself. Plant roots will readily grow between overlapping layers of any fabric as they attempt to find access to moisture above ground. As they weave their way through the layers, roots may become kinked and otherwise caught in a messy entanglement that’s hard to later remedy. So, do it right in the first place. Skip the fabric, and if you’re not convinced to do so yet, consider reading this very popular post on on the subject. Avoid the lure of colorful round pebbles. Install functional paths that will weather the test of time and mulches that will encourage rather than suppress the complex life beneath your feet. It’s easy to neglect your garden design project in winter, but here’s the thing: winter garden design projects may ensure you have a garden ready to enjoy in time for spring or summer! 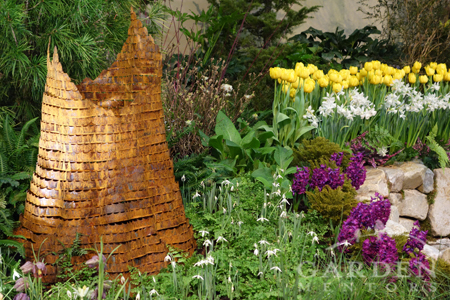 Dream up loads of garden ideas this winter at the Northwest Flower & Garden Show! Remember summer? When your house was an oven and you were desperate to find a cool, shady outdoor spot where you could actually enjoy those long, sunny days? Bet you don’t want to go through another summer crunching across dead lawn instead of relaxing on a beautiful, cool, shaded patio. Want to enjoy your own restorative garden this summer? 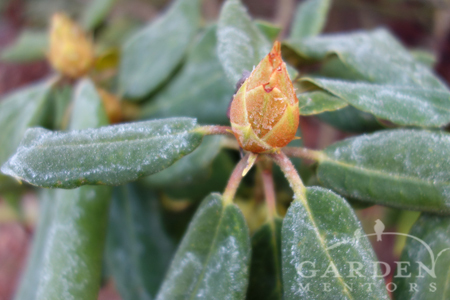 Start with a winter garden design scrapbook & plan. Whether you’re a DIYer or a DIFM (“do it for me”) kind of gardener, there are a number of fun and easy winter garden design tasks to undertake right now. Learn from Parks & Botanical Gardens: Okay, it’s raining. So what? It always rains and sleets and is cold in winter. Bundle up and get outside to find inspiration in what’s happening in finished gardens in the middle of winter. Visit a local park, botanical garden or historical garden to gather ideas for your dream garden design this winter. Ending up with a “winter wasteland” garden won’t happen if you know what works well in your area during the winter months. There’s no reason your garden can’t look fantastic all year — even when you’re gazing at it in January from the cozy comfort of your warm winter window seat. We love the Washington Park Arboretum Joseph A. Witt Winter Garden, the Bellevue Botanical Garden, Kubota Garden and The Chihuly Glass Garden in Seattle in winter. 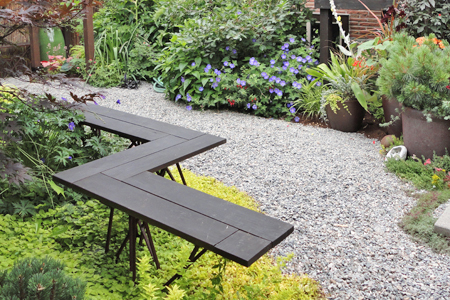 For other locations nationwide, see our A-Z Garden Tour page. Can you remember what color your winter evergreens bloom come spring? If you have them, include photos of your current garden, including imagery that shows what color that big old rhodie blooms in spring and what dormant perennials will emerge from the soil come spring. If you know plant names, jot them down in your notebook. If you don’t know the name, every photo will help. Sometimes it may seem like you’re grabbing at straws, but an experienced designer will be able to help you drill down on what you’re really after and what will actually work in your landscape. Set a budget: Even if you have no idea what a reasonable cost will be for your dream garden, you probably know how much you can afford to spend. When you arm your designer with an understanding of your finances, s/he should be able to help you prioritize your work to get you the most bang for your buck. The great thing about creating a garden is that most can be built in phases. So dream big and aim for what you want knowing you’re creating a living space that will continue to grow with you. Start a Design: If you need professional design help, begin gathering referrals and set up appointments right away. Or heck! Just fill out our contact form now, and we’ll be in touch shortly to get you started – whether you need a full design or just a consultation to get you past any blocking issues. 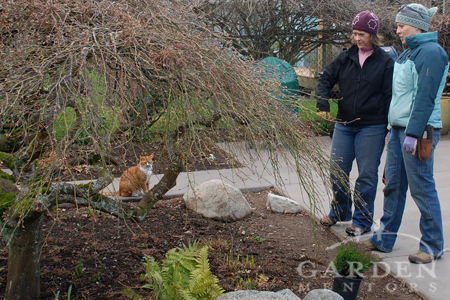 Hire Garden Mentors to get started on your garden design project this winter. If you wait until spring to make those initial calls, your design project probably won’t start until late spring or even summer, which means you’ll be building things out much later in the year – so much for that summer garden. Following the first really warm, sunny weekend in spring, our office is inundated with calls from excited, anxious-to-start homeowners who want their garden ready to enjoy yesterday. Please don’t be that person; we hate to be the bearer of bad news. If you’re a DIYer, start measuring your space on a clear, dry day. And, begin mapping out a project plan, adding that to your scrapbook project. Test your soil: Your garden is a living space, and much of what’s alive relies on what’s underfoot for its survival. Investing in soil health is critical to building a garden that will thrive. Not investing in your soil may set you up for a garden that limps along or simply fails, resulting in a huge loss of investment. Ordering an inexpensive routine soil analysis from an accredited lab like Amherst Soil Lab is a great way to get started in understanding the ground below you. Once you dive into your garden plan, you’ll have a fun, inspiring project to get you through the cold, dark, wet days of winter. Your cabin fever frustrations will melt away as you throw your energy into designing healing outdoor garden spaces. Planning your garden will help break up winter’s tedious gloom. Whatever you do, don’t hibernate all winter and hope that your garden will suddenly appear when you exit your cave come spring. 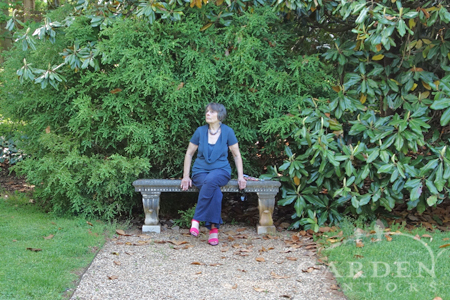 Dream of working with a garden designer but can’t afford the price? Then get your green thumb over to Molbak’s Nursery this Saturday (September 13, 2014) between 11am-2pm, and get in line for a one-day-only, free garden design consultation opportunity with Garden Mentors® founder Robin Haglund. Meet with Garden Mentors founder Robin Haglund at Molbak’s Nursery on September 13, 2014 from 11am-2pm for your free garden design consultation. 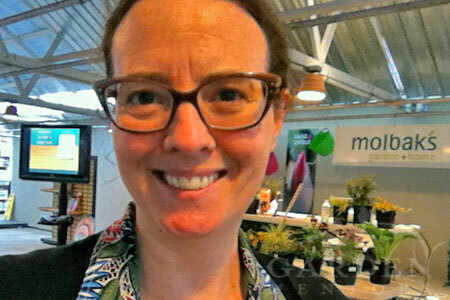 Robin will be on hand to answer any gardening question you want to throw her way. If it’s not too busy, she’ll even walk with you through the nursery to choose plants, tools, art, containers, furniture or whatever you need to complete your dream garden. And if it is busy, shop on your own and then swing by her table to review your choices together before you check out. Bring photos of your current garden and images of your dream garden to share. Then, during your free garden design consultation, Robin will help you take smart next steps in getting over any stumbling blocks and righting yourself on the fun path that leads to the realization of your dream garden. DIY or DIFM gardeners alike will benefit from free garden design help, so don’t miss out! Get more information about this free garden design event at Molbak’s, and learn about all the other fun happenings the nursery has planned all day long this Saturday. Not sure how to find Molbak’s in Woodinville, WA? Directions and contact info here. One thing every homeowner wants is a garden with curb appeal. 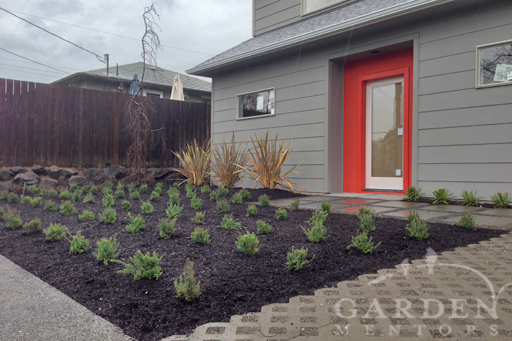 One thing new builders create are yards with zero curb appeal. Maybe they don’t see the value in putting in a beautiful garden that will thrive in the space, or maybe they run out of money on construction, or maybe they just trust the cheapest sub’s out there to pick up whatever plants are on sale at their construction supply stop, and just plop things in. All of these things are likely given what we regularly see shoved into the ground around remodeled buildings and new construction — just before the house goes on the market. And once that house sells (and it will sell) the homeowners are stuck with a space that’s not likely to thrive — except for the weeds; those will definitely thrive here. This house near our HQ is a good example. Sure, it’s better than what used to be there: a crumbling shack where an old drunk died as his trick-turnin’, crack-sellin’ lady friend wheeled and dealed out the back. The construction company has kept up a “Built Green” sign over the months that they’ve been putting up the house (and demolishing a tree in the back and compacting the soil everywhere). Gotta say: the curb “garden” is not built very green. And, it’s really ugly. 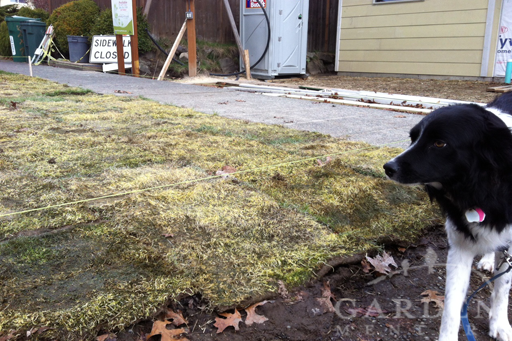 Months ago, well before the house was anywhere near completion, they brought in a load of sod. 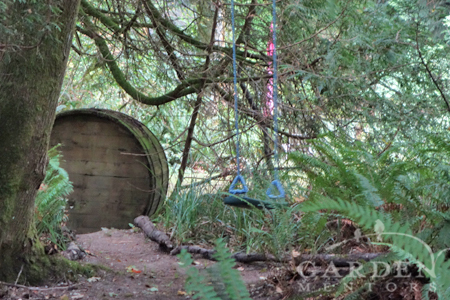 It languished in the back of the property in a rotting pile for months. Then, when it was mostly dead, they squared it out on the hellstrip, which they had been driving over, parking on and otherwise destroying for months. Before they randomly squared together the mostly dead sod, the soil was given no preparation. This is what it looked like when it went in. (Looks like even Kula was disgusted by it.) Seriously, do these guys not get that the trend is less lawn: more food? The front yard is marching line soldiers of Heather. (Update: rough count: 81 Heathers!) Should all of these plants survive, which is unlikely, the front is going to be a giant wad of this plant, accentuated by spikes of Flax, which will also probably die come winter. And, don’t even get me started on the infestation of Ice Dancer Carex that’s going to happen where they’ve plugged in more marching soldier plants — complete with a military buzz cut. And, to top it all off, they threw in that builder special: a weeping tree, planted North of the house, where it won’t help cool things down. In this case, it’s a weeping Beech right out the front door — perfect for attracting sugar-dripping aphids and the stinging insects that eat them. Years ago I heard a saying: “A yard is where you put prisoners; a garden is where you want to live.” IMHO: this space is more the former than the latter — what do you think? Perhaps another perspective beyond the rant above is that this is just an opportunity for future improvement. Whoever buys this place is going to need help creating some real curb appeal — a real garden. Rather than this pretend xeriscape monoculture, this little plot is ideal for some front yard edibles, herbs, maybe a rebate-incentive program rain garden, or any number of other innovative garden options. It’s just a shame the “Built Green” builder didn’t figure that out in the first place. In each space I’ve lived — city, farm, ranch, suburbia — my family and I have continuously honed gardening methodologies that makes us what I’d call semi permies. And, our most recent garden renovation project might inspire you to aspire to the same. 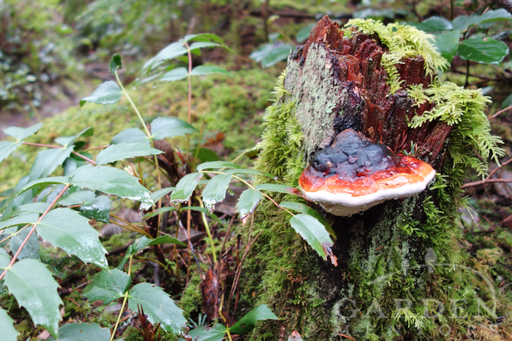 Spending time connecting closely with our natural world keeps me grounded as a semi permie! I’m not likening my methods to a semi-permanent hair solution that eventually washes out; my endeavors are more permanent, but not completely “permie“. By semi permie, I mean I seek out ways to work with nature and with what we have on site first — but not always. I recycle, recapture, and reclaim what I can. I grow and build habitat to invite in wildlife. I host honeybees, mason bees, and I’ve even adopted unwanted bumblebees. I seek ways to borrow or barter with friends and neighbors next. And, when necessary, I’ll purchase what I need to create and maintain a wonderful piece of planet as much in step with nature as I can manage, enjoy, and in some cases tolerate. It’s not the permaculture ideal, but it is the reality my family and I can live with. 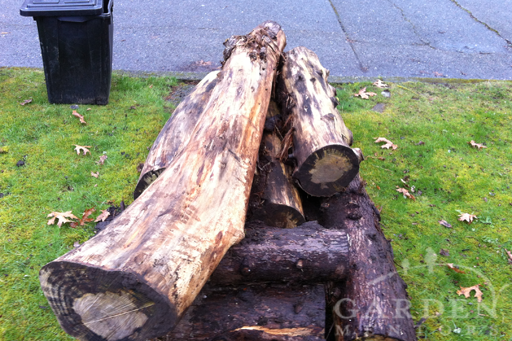 Nurselogs a neighbor was giving away curbside – a semi permie scavanger’s dream come true! 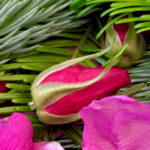 Space, time, interest, passion, resources, and other factors have always played into how much (or how little) each of my gardens could self-sustain. I grew up looking to make use of what our land offered rather than buy in everything we needed — or thought we needed. But, I also grew up buying things. I am thankful to live in a world where I can purchase rain barrels to collect water, a warm climate lime for my curry, and call an arborist to bring me chips s/he wants to recycle from another job site in the neighborhood. And, I can combine the function of these purchased or bartered goods to water my garden during drought, pluck cilantro from my greenhouse to finish that curry, and line my paths and replenish my beds with the chips my arborist offers up. Embracing this balanced urban approach is just how I roll. 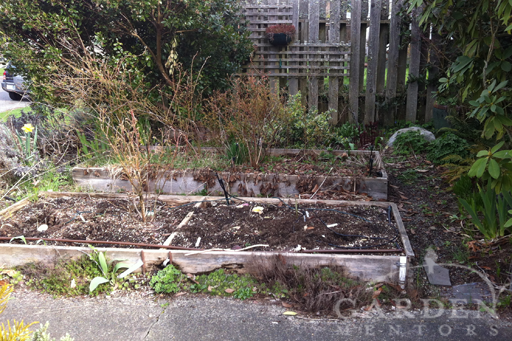 When we moved into our home years ago, our first gardening project was digging out a section of lawn to install a couple of raised seasonal vegetable and perennial berry garden beds. We made several mistakes, but the area served us well until about a year ago. After almost 15 years, the cedar beds were finally rotting through. The pea gravel paths over landscape fabric were hideous. And, grass had invaded the berry bed, which housed wonderful blueberry shrubs and not-so-great-anymore strawberries. Sounds and looks (see below) like renovation time, right? Raised cedar beds desperate for renovation after putting in over 15 years of growing well for us. This area of the garden happens to get the last of the late evening sun. It’s not a big space, but we wanted to reclaim part of it as a sunset spot for a couple of chairs. You know — a wine sipping spot for two at the end of a long day. We also wanted to create a bit of buffer between the nearby sidewalk to the west — without blocking the sunlight. And, we wanted to be able to continue cultivating some edibles in this sunny garden pocket. But, because we know we may need to a big sewer excavation near this spot within the next couple years, we didn’t want to spend a lot of money making an enormous, costly change right now. In fact, the almond tree that will eventually live in this area is spending its first few years with us growing up in a pot.